Captain Krishnakumar Pun from Queen’s Gurkha Engineers was awarded this year’s Fishmongers’ Gold Medal Award. 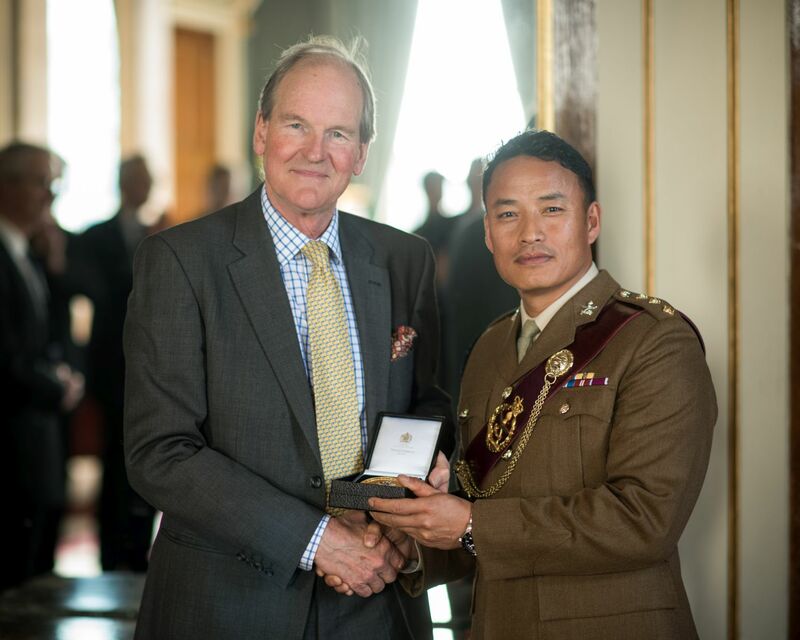 He received the medal for his contribution to Operation MARMAT 4 as a Field Troop Commander. The award ceremony took place on 9th March 2017 in The Fishmongers’ Company Hall, Central London. The Fishmongers’ Company is one of the oldest City Guilds, with a rich history that expands over 700 years. Captain Pun was tasked with building Amar Jyoti school, in the hills of Lamjung District. The original school, educating 125 primary age children, many of whom had to trek upto 2 hours each way to attend, was destroyed in the earthquakes. The village is the final settlement before reaching the Himalayas, and is where the dirt track road ends. Captain Pun deployed to Nepal in the advance party, and with a small reconnaissance team from his Troop, immediately went into the hills to assess the proposed site of the new school. The site required some rapid remedial works by the team, before construction proper could begin and Captain Pun tasked his small team, as well as corralling the locals to assist in clearing the site. All this whilst confirming reconnaissance and construction details, and preparing for the arrival of the rest of his Troop, with the construction of a 35 man tented camp. Against the clock, and as a result of his considered direction, and strong leadership, the site was prepared in less than a week, ensuring the project was not delayed before it had even started in earnest. Captain Pun’s Troop was an amalgamated grouping from the Brigade of Gurkhas and wider Army. He brought together those attached from the RGR, QOGLR, QG SIGNALS as well as the British Medics and Vehicle Mechanic, exploiting their individual strengths, and mitigating any weaknesses. The team bonded very quickly, ensuring that their efforts on the school build were focussed and effective. All pulled together, galvanised by Captain Pun; his compassion, dedication and enthusiasm were infectious, and made all want to achieve the highest of standards and workmanship in every task they turned to. This ensured that when there were setbacks, be that delays in the arrival of construction material, or extremely poor weather stopping work, morale never wavered. Operating at the very top of his game, Captain Pun has confirmed his leadership ability and capacity to deliver consistently top quality work in austere conditions. He has quite simply excelled in all respects, and was instrumental to operational success, all the more impressive considering he is a very junior Captain. For a significant contribution to the local community, in the most testing of circumstances, and adding value at every turn, Captain Pun is eminently worthy of recognition by The Court of the Fishmongers’ Company for their Gold Medal award in 2016.